One of the best ways to get attention for your brand is through social media ads. Whenever someone mentions social ads, Facebook is at the top of the list. With Facebook’s recent challenges with ad targeting, privacy permissions, and misuse of user data, some firms are looking beyond Facebook when searching for a home for their social ad dollars. Focus on B2B: LinkedIn is centered around B2B interactions so you can trust the interactions on the platform are all about business, which is heaven for those of us in the IT channel. Low-hassle audience selection: LinkedIn has a consistent and accurate tool for categorizing users. This allows people who are using ads to get their message in front of a specific group of people based on a number of variables including job title, location, language, company, years of experience, and group membership among others. Keep in mind these advantages cost a premium. Facebook has a larger pool of users they can show your ads to, lowering the cost of presenting your ads to your target audience. We are finding that Facebook’s targeting isn’t always exact and ads may end up in front of people who just aren’t interested in your area of expertise. With LinkedIn, you’ll get in front of fewer people, but rest assured they’ll be the right people… the ones you’ve identified in your ad profile. The secret to getting the most out of your efforts on LinkedIn is to have a solid strategy, centered around some pretty powerful ads. An ultimate goal: Realistic goals for social ads revolve around audience growth, lead capture, and direct sales. We suggest starting conservatively. If you’ve already run ads in the past, aim to increase previous results by 15%. An ideal budget: As with any ad campaign, you’ll need to establish just how much you’re willing to spend. With social ads, budgeting and timing go hand-in-hand. So as you’re exploring how much you want to spend, you’ll also need to address how long you’d like your ads to run. Here’s why: LinkedIn suggests you set a daily spending limit for your ads. It can be as low as $10 per day but the suggested amount is $50. 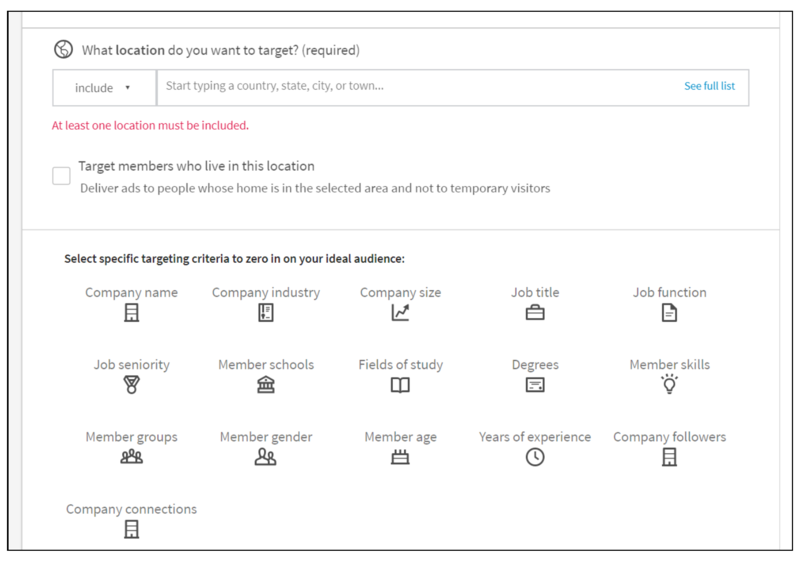 You’ll notice you have 16 areas from which to choose in addition to geo-targeting. As we mentioned above, LinkedIn’s targeting is quite accurate and the attention users provide on the platform is high quality. Though LinkedIn users don’t log onto the platform as often as Facebook users, this audience comes to LinkedIn for business-related activities, and they’re more interested and engaged in B2B offers. Links to your company’s email newsletter. Active Employee Profiles on LinkedIn: Be sure your employees are active and engaged on LinkedIn and that their profiles are up to date. This will help drive traffic to your company page. You want traffic to the page for many reasons, but one that relates to LinkedIn ads is that you’ll be able to tell which posts are the most popular with your target audience. This gives you an indication of content quality. LinkedIn allows you to sponsor your most popular posts to get them in front of people in your target audience who don’t already know about your company. Participation in LinkedIn Groups: Encourage employees to join and participate in the many groups available on LinkedIn. This gives your company exposure, drives traffic to your page, and helps increase interactions with the best content on your company page. This again gives you the advantage of knowing which types of content you should put money behind to get more exposure for your brand. Once you have consistent activity on LinkedIn, you can turn your attention to LinkedIn ads with confidence, knowing you have a strong foundation from which to launch your efforts with social ads on the platform. The next step in the process is understanding the types of ads available to you and which ones are the best to use based on the strategy you’ve developed. You have several options for presenting yourself visually through LinkedIn’s platform to your target audience. Sponsored Content: With sponsored content, you have the chance to take the most popular posts from your LinkedIn company page and place them in front of LinkedIn users who weren’t previously exposed to your brand. You also have the chance to create previously unused/unseen content as well. Video Views: Sending more traffic to your videos for greater brand awareness. Text Ads: These ads can be quite useful if you have a solid audience criteria and low competition for the terms/topics you’re bidding for. LinkedIn offers a tour on its text ads here. Sponsored InMail: This ad option allows you to send an InMail message to a targeted group on LinkedIn. LinkedIn offers a tutorial on Sponsored InMail here. New! Video Ads: LinkedIn just launched the video ad option for all of its users in April 2018. We highly suggest you explore creating videos to engage your audience on LinkedIn. Here’s why: 52% of marketing professionals worldwide list video as a top driver of ROI, according to HubSpot. Note: A tool to quickly and easily create quality videos is wave.video. Bottom line: Provide Value. No matter what type of content you’re creating for your ads, just be sure the content holds high value for your audience. As a quick reminder: A value piece for your audience should solve a problem they’re facing. If it doesn’t provide a complete solution, it should move the user closer to finding a solution to their challenge. That’s what creates brand loyalty, sign-ups, and return visitors. Should I include a content offer at the end of my video or simply provide a link to my website? How much many views should an organic piece of content have before I make it a sponsored post? Should I choose pay-per click (PPC) or cost per thousand (CPM) pricing? Keep in mind PPC and CPM are cornerstones of budgeting properly for social ads, whether on LinkedIn, Facebook, or Twitter. Knowing how to get the most for your ad dollars gives you a major advantage over the competition when using social ads, especially on LinkedIn. In these situations it helps to have help from a partner who can see the challenges you may face before they ever crop up. Presh Marketing Solutions can help you navigate the sometimes complex landscape of social ads and give you the insights necessary to create an seamless digital marketing strategy. Let’s have a conversation about next steps.